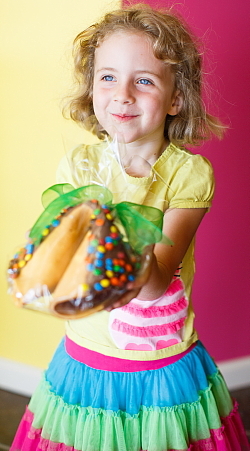 Bakers of personalized fortune cookies, giant fortune cookies, and chocolate covered fortune cookies since 1988! As you might expect, a gourmet fortune cookie company has a colorful past. You can see the history of our company right here, and learn how Mike Fry invented flavored and colored fortune cookies. For 24 years Mike was the inspiring entrepreneur who never stopped dreaming up new cookies and fun things to do with them. Since 2005, as his wife I’ve been a co-owner and full-time participant in all things fortune cookie. Over the years, I took on more of a managerial role and focused on sales and customer relations. I continue to run the business with the same zeal for innovation that started the cookie dough rolling. At a time when so many companies are struggling, we’re blessed to be able to keep on baking our delicious cookies—thanks to our many loyal customers. Perhaps because a fortune cookie is simply an irresistible message delivery system, we continue to create custom cookies for numerous celebrities and national brands. 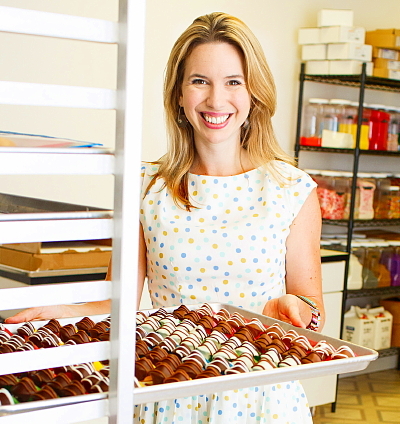 We’re proud to be an American small business success story. And we're thrilled with all the media attention we get...check it out here. So even though our Prankster-in-Chief is no longer here to make us laugh, we’re doing our best to keep his spirit alive. Mike would be especially excited by the introduction of our Colorful Candied Giants, an idea he’d been working on. These are really big fortune cookies (nearly a pound!) that we bake in all our vibrant colors and flavors, which makes them even more astonishing. We’re also having fun adding various candies to the chocolate they’re dipped in, then stuffing even more candy inside them for an extra surprise. 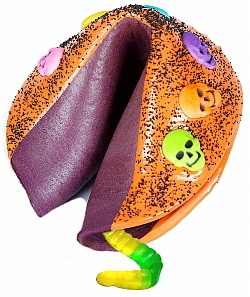 In addition, they come with custom full-color graphics on huge matching fortunes that you get to personalize. I’m particularly glad that meeting Mike brought me to the heartland, bec ause now I’m settled in a wonderful community here in Indianapolis where I can raise our daughter, Ella. As so many of you know, being a mompreneur is a daily challenge, but I’m fortunate to have enough space here for Ella to have her own playroom full of activities to keep her out of most trouble in those after school hours. Besides, she’s learning the value of hard work and cooperation. She’s at the age when she’s starting to have her own ideas for new flavors…mac ‘n cheese cookie anyone? Well maybe not yet. Still, I can see Mike’s playful inventiveness lives on in her. Another aspect of life here that inspires me are the many other entrepreneurs making artisanal food. We’re proud that all our ingredients and fresh, whole and natural—no powdered eggs in these yummy fortune cookies—and we continue to make each batch to order with much care and love. We have a wonderful team working here, who all take enormous satisfaction in baking the world’s best tasting and most beautiful fortune cookies. You really can taste our quality in every crunchy bite. For example, one of the secrets to our wildly popular classic vanilla cookie is that we splurge on a much higher grade of vanilla than you’d find in a typical restaurant cookie. Nor do we use strange chemical compounds or additives in our products, and our cookies are baked fresh—not stored for years in some warehouse in Shanghai. 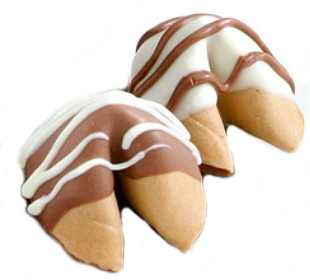 All of our fortune cookies can be ordered dipped and or drizzled with white or milk chocolate, as well as with that 21st century health food, dark chocolate. Yes, we refined that process, too, and continue to innovate new styles of applying chocolate. And unlike our competitors’ cookies, there are no waxy compounds in our chocolate, just pure, silky delight. For us, it’s all about creating the very best taste experience for our valued customers. In this era of so much outsourcing, we’re dedicated to baking all our cookies right here in the U.S.A.. We pride ourselves in providing solid jobs for American families—all of our fortune cookies are lovingly hand made in our Indianapolis, Indiana bakery—we don’t outsource any aspect of our business. We even print our own custom fortunes and wrappers, as well as colorful labels for our Dazzle Dozen gift packaging. Give me a call and find out what amazing ideas we have for you. 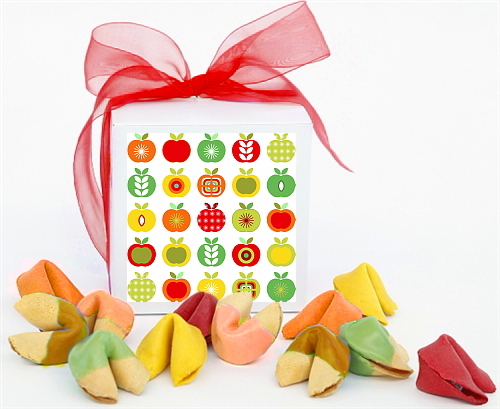 From our humble beginning, we've gone from inventing the very first gourmet fortune cookies (strawberry, lemon, orange, blueberry and mint) to creating a whole fun menu of flavors in brilliant colors that you can customize with your own messages or promotions inside. Since 1988 we've developed 25 delicious, turbo-charged flavors happily sold to individuals, companies and restaurants across the U.S. and beyond. Our flavor development and taste testing process is exhaustive, and we now offer such unusual ones as cappuccino, green apple and pumpkin pie—all guaranteed to be the best fortune cookies you ever tasted. In 2012 we moved into a brand new bakery here in Indy, and I’ve had fun decorating the showroom to be as colorful as our cookies. You’re welcome to drop by and taste some samples—we can promise you that our cookies will NOT remind you of your last Moo Goo Gai Pan. Our most popular fruit flavor is orange, and it tastes just like, well, you guessed it—delicious oranges. That’s because we invest in the highest quality ingredients we can find and remain determined to bake the best fortune cookies on earth. One of our core values here at Fancy Fortune Cookies is to provide world-class customer service. We’ve been blessed to help clients as diverse as FedEx and Mr. Rogers, Magic Johnson and Jackie Chan, Martha Stewart and Oprah herself. Another reflection of our quality product is that high end hotels in Las Vegas like the Venetian and the Bellagio have used our cookies for their special promotions, and the exclusive W Hotels placed our fortune cookies on their pillows as part of their turndown service. We have yet to get an order too big. 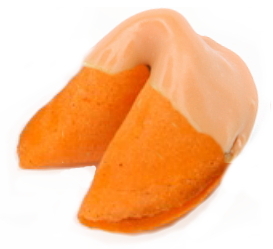 In the late ‘90s we shipped 1.1 million customized fortune cookies to an American pharmaceutical company for a special promotion. 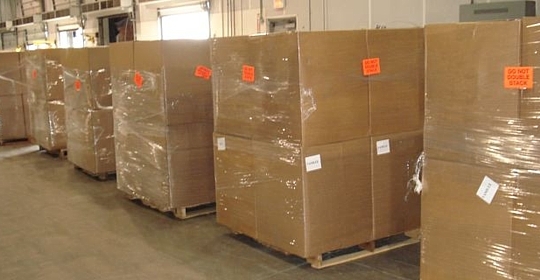 More recently we sent 750,000 assorted flavored cookies all the way to France for resale. We ran shifts around the clock, and we had a blast working with that client. We often ship orders to companies in the UK, and we can send your cookie order just about anywhere. (Hey Richard Branson…want some fortune cookies to take into space?) Hop over here to read some of our many testimonials from thrilled customers. We can also handle small orders with very special needs. We’re the only fortune cookie company that works so closely with clients that a Today Show producer in New York called us in Indiana when no one on the East Coast could do a same-day delivery to correct his oversight. He needed cookies the next morning for a Chinese New Year segment. The cost of the cookies: $35.00; cost of Fed Ex same-day shipping: $240.00. We had the producer’s order ready for a 2:00 p.m. pickup, and they were delivered to him later that day, practically still warm! No one on earth can turn around fortune cookie orders like we do. And how about this for a special order: we’ve conspired with more than a few creative men by baking one extra special fortune cookie just for them that contains a magical marriage proposal. It’s fun ideas like those that keep me eager to get to work every day and see what new people we can help with our delicious delights. One of the most fun aspects of baking gourmet fortune cookies, is that no one can resist opening one. The implicit promise nestled inside each tasty treat is a message of encouragement and optimism. We’re ready to help you spread some smiles among your friends, family, associates or customers. Contact us today—you’ll be happy you did. And that’s our promise to you.